After a customer engages with your business, you should send them a survey promptly. That way, you capture genuine insight from the customer while the interaction is still fresh in his or her mind. If you wait too long, those initial impressions can become less clear—and customers are less likely to remember key details and how the experience made them feel. The ideal time frame is to send a survey to customers within 24 hours after any contact with your company. With that approach, you can quickly know if customers aren’t happy with the service they received—and take steps to and rebuild trust with the customer. In the early stages of a CX program, companies may only collect CX feedback via one channel—but they should have a vision of moving towards multi-channel feedback gathering. The reason? Customers interact with businesses in a variety of ways and expect companies to do the same. A multi-channel feedback gathering model is emerging as the clear best practice. With this approach, companies use a mix of SMS, IVR, email and web-based surveys to reach a broad spectrum of customers. Some companies rely on customer contact preferences to determine which channel to use for each customer. Others may use the channel the customer most recently used to distribute a survey. The most advanced companies often use a hybrid feedback gathering approach that employs multiple-channels to seek customer feedback from a single customer. With a hybrid approach, a company may send an email survey first, then follow up with a SMS request, for example. Most of your customers are deluged with information daily. Your survey request is competing for their attention. If they do opt to offer their feedback, you don’t want to deter them with too many questions. It may be tempting to seek more survey insight when you have your customers’ attention—but take caution. A large-scale study of more than 100,000 customer surveys found that the survey drop-off rate increases as the number of questions grows. 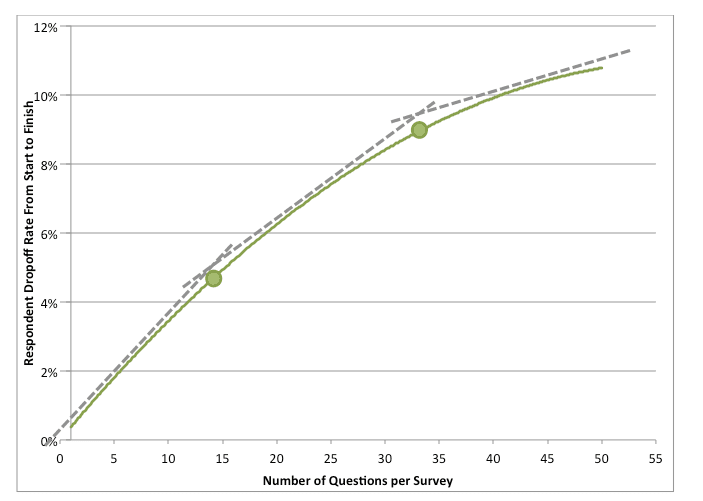 The research found that the drop-off rate increases sharply for each additional question up to 15 questions. This means you need to weigh the incremental value of each question against the probable drop in response rate. Before launching a survey, you need to make sure it’s easy-to-understand and works on the intended channel. If your survey is too wordy and hard to follow, your customers may grow frustrated. For example, you may ask the same questions in surveys across your web and SMS channels. However, while the web channel can use features such as radio buttons or drop downs, you need to adapt the SMS survey to ensure customers can type quick responses. You also want to craft questions carefully. Use a neutral tone to avoid words that could lead your respondents to have a particular opinion on any topic. Also, ensure that you do not ask for too much information—such as ratings of two distinct products—in any single question. Survey design mistakes such as these will cause customers to give up. As noted in Forbes, 80% of customers say they have abandoned a survey part-way through, with 52% claiming they aren’t willing to spend more than three minutes providing feedback. Closed-ended surveys are relatively easy to set up and interpret. 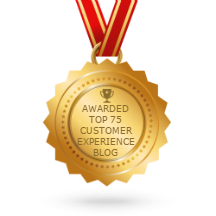 They also provide quantifiable metrics that can help you chart important trends in your CX practice. Voice of the customer is the customer’s voice, expectations, preferences, comments, of a product or service in discussion. It is the statement made by the customer on a particular product or service. With VoC feedback from customers, you can fill in gaps in your knowledge about how your products and/or services are perceived by your audience. This insight can help drive critical shifts in the experiences you provide to customers on the evolution of your offerings. You can also share VoC with your internal team to help them understand how the work they do directly affects customers’ lives. 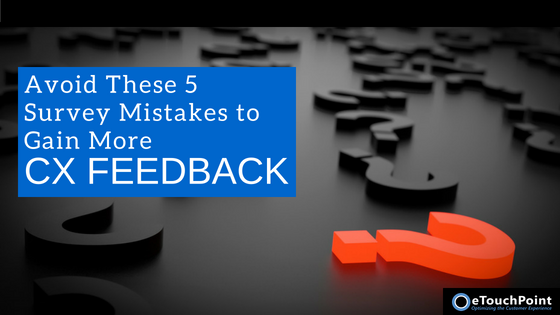 Also, when customers have the chance to provide open-ended feedback, they are more likely to feel that their opinions have meaning to your company. Without question, surveys are a vital component of any CX initiative. However, CX professionals need to take a thoughtful approach to survey design. If you rush to get more information from customers, you may make avoidable mistakes that can diminish your response rates. Instead, you should build short surveys that reach customers across multiple channels and provide them opportunity to offer meaningful feedback. The right survey approach can help your customers feel heard and help your company make the strategic advances it needs to evolve into a CX leader.